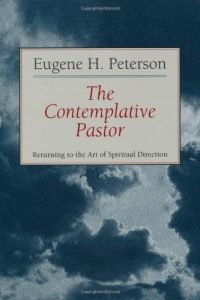 On August 1, 2006 I ordered Eugene Peterson’s book The Contemplative Pastor. Reading it was a balm to this pastor’s soul. Peterson rails against the id ea that a pastor is called to ‘run’ a church. He believes that the adjective ‘busy’ modifying ‘pastor’ should grate against our ears with the dissonance of ‘adulterous’ attached to ‘husband.’ He invites pastors, who have been culturally set up to rise and fall with the numerical success of their congregations, to return to their calling to shepherd, to pray, and to preach. In this book he told the story of his sabbatical. For a year, he and his wife disappeared to a cabin in the woods and emerged refreshed and energized. At the point I read this book I had been in ministry and at the same church for a month shy of 21 years. Vacations had come and gone. The church had graciously given me study leave and the opportunity to attend occasional conferences. But I had never experienced the kind of rest and renewal Peterson spoke of. When I broached the subject with my elders, they were supportive. We began to develop a sabbatical policy that would apply not only to the pastor but in a modified but meaningful sense to ruling elders as well. And then, sadly, dynamics in the church began to unravel. Stress points to which I was blind, or which I did not want to see, became fissures and the fissures became chasms. Sabbatical was put on hold and then in 2010 it became necessary for me to leave that church for another. The church to which I came longed for stability and a building to call it’s own, hopes which God over the next few years granted. In June of 2016, I raised the subject with these elders that I had had to abandon in 2010. They were receptive and eventually adopted a policy governing sabbatical leave for pastors and elders. In October of that year I spoke of this for the first time to the congregation and recruited a committee to help in the planning of a pastoral sabbatical. The fruit of their work has already been felt and will be experienced in earnest on April 9 when my sabbatical begins. And it was all set in motion by a book purchased nearly 12 years ago.